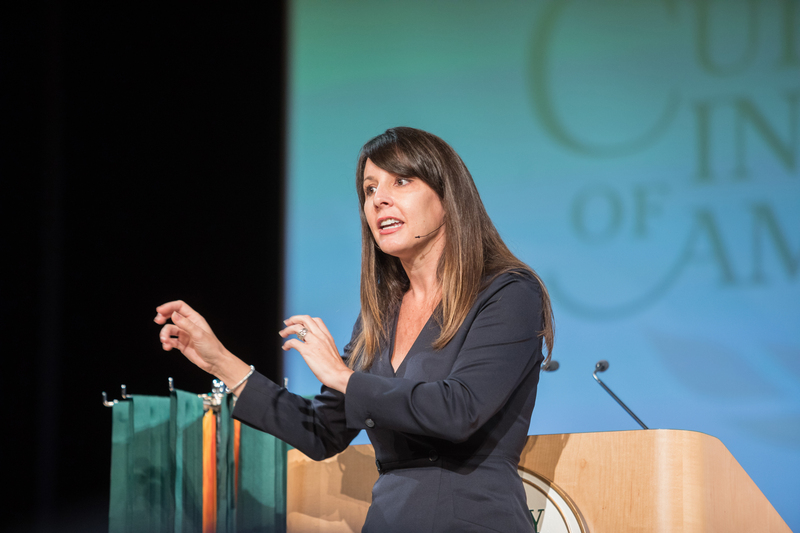 Hyde Park, NY – Cheryl Henry, president and chief operating officer of Ruth’s Hospitality Group, Inc., spoke to graduates of The Culinary Institute of America during commencement ceremonies at the college’s New York campus on September 29. Ruth’s Hospitality Group owns restaurant brands Ruth’s Chris Steak House, Mitchell’s Fish Market, Mitchell’s Steakhouse, Columbus Fish Market, and Cameron’s Steakhouse. Ms. Henry leads the company’s operations, human resources, information technology, real estate and development, and brand marketing departments. She previously served as the group’s senior vice president, chief brand officer, and chief business development officer. Before joining the restaurant world, she was chief of staff for the mayor of Orlando, FL, and was a vice president for the public relations and marketing communications firm, Curley & Pynn. Ms. Henry was featured in the Forbes article “An Amazing Lesson in Women’s Entrepreneurship: Ruth’s Chris Steak House.” In 2008, she was named to the Orlando Business Journal’s list of Women Who Mean Business Up-and-Comers. The entire CIA graduation ceremony, including Ms. Henry’s address to 54 recipients of CIA associate degrees in culinary arts and baking and pastry arts, can be seen online.